Both news itmes broke out almost at the same time. Law is chasing a perpetrator after sixty years. It happened thousands miles away from Bangladesh. Two unrelated stories happened three decade apart but they are uniquely related in a single thread of humanity. Both Demanjanuk from Ukraine and Moitta Nizami, from Pabna, Bangladesh have taken part in the torture and mass killing of people. 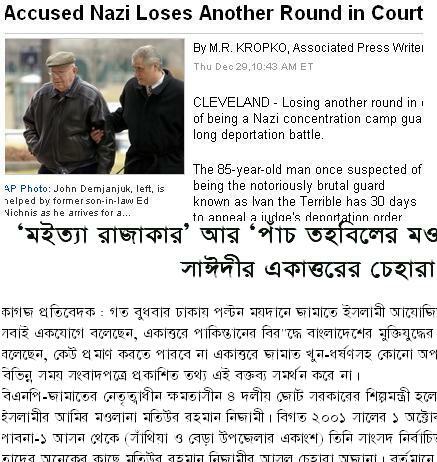 As AP reports on December 29, 2005, the 85 year old Demanjanuk is accused of his role in mass killing at Treblinka Concentration Camp where he was a security guard. On the other hand, the other criminal Nizami has yet to face law for his involvement in the killing of people of Pabna in 1971. He is now our Industry Minister. A Bangladesh Daily on December 30, 2005, puts out the elaborate portrait of his heinous activity during Bangladesh Liberation War in 1971 against the people of Pabna District. Law chases criminals anyway whether it happens right now or right after sixty year.